Watching the original Planet Of The Apes movies some 40 years after their theatrical release makes for an intriguing look back. The first, simply titled Planet Of The Apes (1968) was adapted from the Pierre Boulle book, with a screenplay by Rod Serling. The premise of Earth having somehow de-evolved over time, with apes moving to the top of the food chain, and humans little more than mute animals, was a fascinating one. It has since taken its place as a bona-fide sci-fi classic. The four sequels are another story. They inhabit a genre I like to call "ape-sploitation." Unlike many sequels however, the later Planet Of The Apes installments all had a point to make, rather than being simple knock-offs of the original. Beneath The Planet Of The Apes (1970) dealt with the after-effects of a nuclear apocalypse, and introduced a population of mutants who dwelled beneath the rubble of what was once New York City. At the end, an ultimate doomsday machine is activated, which obliterates the entire planet. It the writers thought that they had killed off the series for good, they were mistaken. In Escape From The Planet Of The Apes (1971), we find that our ape-heroes Cornelius (Roddy McDowell) and Zira (Kim Novak) have managed to get the human Taylor's (Charleton Heston) ship running again, and are able to blast off just before Earth explodes. Unfortunately this takes them back in time, to Earth circa 1973. Escape has two major points to make. The first is about the exploitative nature of the media. Zira becomes a star as she espouses her liberated ape-woman views (remember this is 1971, right at the time of the women's lib movement). The other point deals with the growing distrust of the government. Again, current events informed the script, as the Pentagon Papers had recently been leaked. In the film, the powers that be had always been a little leery of what the apes represented, and when it is discovered that Zira is with child, plans are made to destroy it. Through the kindly efforts of circus trainer Armando (Ricardo Montalban), the baby ape is hidden, and another takes its place. All three apes are killed in a shipboard gun battle at the end of the film. 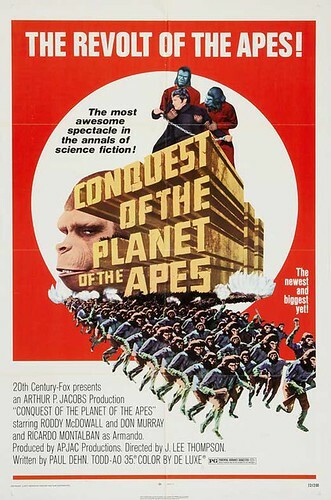 This brings us to Conquest Of The Planet Of The Apes (1973). While director Rupert Wyatt has made it clear that his upcoming Rise Of The Planet Of The Apes is not a remake of Conquest, it is obviously the closest to it of all the originals. Before getting into the plot of Conquest, I must remind readers of the often head-spinning paradoxes inherent in science-fiction time-travel stories. There are often holes in the logic large enough to drive a truck though, so the best advice is to ignore them and enjoy the ride. At the opening of the film, a title card informs us that we are in North America, 1991. We also discover that all cats and dogs had been annihilated in 1983 from a strange virus accidentally brought back from outer space. Mankind turned to simians for pets, and with their remarkable intelligence the apes were soon trained to perform all sorts of menial tasks. Slavery is the heavy-handed theme of Conquest. When Armando brings Zira and Cornelius' child (who will soon be named Caesar) into town, the young ape (Roddy McDowell) is appalled at the conditions his fellow apes are subjected to. Watching one comrade being beaten for a minor infraction, Caesar yells out "Lousy human bastards!" The government officials had always been suspicious that the talking baby ape was still alive somewhere, and this seemed to prove their theory. Armando and Caesar are taken into custody, but despite numerous torture tactics, neither talks. African-American Dr. McDonald (Hari Rhodes), feels an instant kinship, and sympathy for the obviously intelligent Caesar. Gung-ho leader of the Department of Ape Management Breck (Don Murray) calls McDonald a "bleeding heart," as both choose sides for the upcoming battle. At auction (clearly meant to evoke memories of slave auctions), Caesar is sold to the Governor, and sent into training to become a domestic. There have been an increasing number of acts of disobedience by individual apes, but Caesar organizes them into an army. They steal knives, guns, and anything else that can be used as a weapon, in preparation for all out war. When Breck feels that his suspicions about Caesar are confirmed, a massive search for him is conducted. McDonald hides Caesar, and tries to express his feelings of sorrow at what is happening. Caesar then breaks his silence and says "I understand." Caesar does manage to escape, through the help of McDonald, and gathers up his ape army to rise up once and for all against their oppressors. The fight is stunning - played out in the futuristic environs of Century City, CA . At first, the apes have only primitive knives and clubs, but then they discover a cache of guns. They were brave and determined previously, but with the guns they become an unstoppable force. "Tonight we have seen the birth of the planet of the apes!" Of all the sequels, Conquest Of The Planet Of The Apes is my favorite, as it shows just how this upside down world came to be. There are a couple of interesting names associated with the movie worth mentioning. Jazz musician Tom Scott, who recorded on his own, and as a crack session man for artists such as Paul McCartney is the musical director. The music is anything but jazz, believe me. The other curious participant is the Associate Producer, Mr. Frank Capra Jr. Conquest Of The Planet Of The Apes is about as different from his father's It's A Wonderful Life (1946) or Mr. Smith Goes To Washington (1939) as one can possibly imagine. The story of a downtrodden people rising up against their oppressors is a bedrock literary device, and stretches back at least as far as Homer, and probably much further. This bodes well for Rise Of The Planet Of The Apes, a film that I am anxiously awaiting.